As the American Civil war entered its third year flags acquired a greater role on both the battlefield and on the home front. This grouping includes flags that represent both the evolution and maturation of the Union's military and naval efforts. 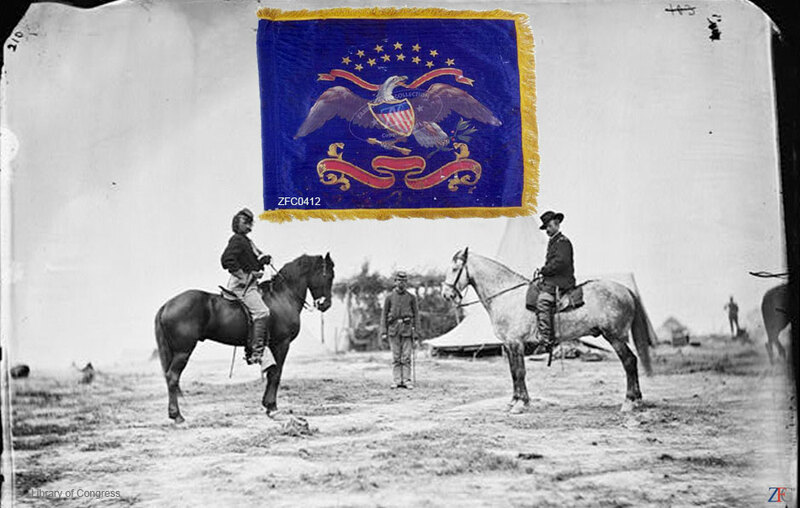 Very significant is the inclusion in the Grouping of a rare cavalry standard and both of types of guidons used by the mounted arm during the conflict, one for loyalist West Virginians. There are three Designating Flags - flags used by higher command echelons - for brigades and divisions; one a brigade of U.S. Colored troops, another representing a division raised in the Western Theatre, and a famous division that saw mush of the hard fighting in the Eastern Theatre. Also included are 34 and 35 star U.S. flags from both the field and fireside, including a 35 star Camp & Unit color for Unionist Tennessee volunteers as well as other flags identified to specific makers while others are identified to their former owners. This Grouping includes parade flags, a patriotic quilt, as well as selection of rare flag belts and slings from the last two years of the war as well as orders, equipment and images relating to the flags of the 1863 - 1865 period. Perhaps the most poignant flags in the grouping are two very different flags; a small 13 star flag identified as a bible flag accompanied by an unidentified tintype of the soldier who presumably carried it and a large camp flag with a star autographed by Major General George H. "The Rock of Chickamauga" Thomas. One huge, the other small and delicate, both relate stories of the American Civil War. Thy U.S. Navy is represented by a suite of flags the a warship would wear - U.S Ensign, Jack and Masthead Pennant.